Homes for Sale in Nevada Trails. 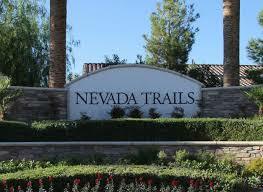 Nevada Trails is a beautiful community that was planned and constructed by Pardee Homes. The community is located in the heart of southwest Las Vegas within the zip code of 89118 and lies between Rainbow Blvd and Buffalo Dr at the intersection of Warm Springs Rd. Many homebuyers are attracted to this community for the superb location and community amenities. The southwest part of town is thriving with popular restaurants, retail shops and has quick access to the 215 freeway and Las Vegas Strip. Pardee Homes is an award winning homebuilder known for their eco-friendly construction of energy efficient homes. Residents here have access to the amazing Nevada Trails Park, which is a full 10 acres of open fields, trails, basketball courts and activity areas. Contact Tracy Drown for Real Estate at 702-245-9341. Single story home on a corner lot/17,424 sq feet lot with a four car garage. Gourmet kitchen with beautiful granite countertops and cabinets and stainless steel appliances. Gorgeous 20 inch tile flooring throughout the house. Huge great room and family room. Very, very big backyard with covered patio. Over $100,000 put into the backyard. Seller looking to sell furnished ($61,000). Too many upgrades to list. A must see, move in ready home. Absolutely stunning home of former Senior Designer of Hotel Ritz Paris. Perfect home for entertaining, with more upgrades than many more expensive homes, including Chef Kitchen with upgraded appliances, two dishwashers, vegetable sink, and more. Built-in Entertainment Center, Built-in Wine Bar with Bottle Rack, Shoe Closet fit for a Queen, Two large master bedroom closets, Water fountains, Pebble Stone front and rear, and beautiful landscaping. Great Curb Appeal. Custom Home on Half Acre. Two by Six Construction. All Bedrooms are Master Suites. Great Home for Entertainment. Garage is converted to Bonus Room. RV Parking on the Side. Mature Fruit Trees. Casita in back yard. Plenty of Space for Pool. Separate Dog Run. WOW! OVER $80K+ BELOW ZILLOW ESTIMATED VALUE OF $843K!!! THIS AMAZING 1-STORY IS EVEN NICER THAN A MODEL HOME. $150K+ IN UPGRADES! BUILT IN BBQ, FIREPIT AND PUTTING GREEN HIGHLIGHT A BEAUTIFUL BACKYARD. KITCHEN HAS ALL MONOGRAM STAINLESS APPLIANCES, GRANITE, TILE AND CUSTOM BACKSPLASH. HUGE MASTER BR WITH SITTING AREA. SUPER HIGH 20+ VAULTED CEILINGS WITH EXPOSED BEAMS, 3 CAR GARAGE! TOO MANY UPGRADES/FEATURES TO LIST! U MUST SEE TO BELIEVE!!! SQ FOOTAGE IS 4707, TAXSTAR IS WRONG. ONE BED/BATH DOWN W/ FRENCH DOORS TO THE BACKYARD, OFFICE WITH ACCESS TO THE COURTYARD. LARGE LIVING RM OPENS TO GOURMET KITCHEN WITH GRANITE, ISLAND, S/S APPLIANCES, WET BAR/BUTLERS PANTRY, SEPARATE FAMILY RM WITH FIREPLACE, FORMAL DINING AREA, TWO LARGE BONUS RMS, HUGE MASTER WITH BALCONY, CUSTOM CLOSET BUILT-INS. SPARKLING SALT WATER POOL/SPA, BUILT IN BBQ, 3 CAR GARAGE, AT THE END OF THE CULDESAC, GATED. Privately-gated forest retreat with $150,000 in landscaping. Fragrant mesquite trees and rare saguaro cacti. Ensuite bathrooms in all bedrooms, luxury touches including $12,000 in custom garage cabinetry, custom wall painting, guest bed + full bath downstairs, granite and quartz counters, city/mountain views, built-in BBQ, putting green, propane fire pit, RV parking. Cared for by same gardener for 20 years. Furniture & decor available. Gorgeous Pebble Road rambler w/grand entry, exquisite finishes, & new solar heated pool! 2,803 sqft home has been polished to perfection w/new tile flooring, remodeled baths, & modern fixtures! Kitchen w/high splash, lg island, & eating nook that looks to the backyard retreat! Master suite boasts tray ceiling & 5-piece bath w/walk-in closet. .44ac has garden area w/raised planter boxes, finished landscaping w/fruit trees, & RV driveway/parking.